Coconut Jam for sale. Buy online at Zingerman's Mail Order. Gourmet Gifts. Food Gifts. My favorite spread find of the year. Across Southeast Asia they make Srikaya or simply Kaya. In Malaysia, the name means “rich” but a more detailed translation might also include "smooth," "creamy" and "more please." This version is made closer to home, in San Francisco. Cristina Widjaja modeled her jam on her mother's recipe. She slow cooks coconut milk, egg yolks and sugar. Its flavor is surprisingly complex for something with so few ingredients. It is deep and sweet like coconut custard, with a texture like lemon curd. Traditionally it’s spread on toast for a morning treat, but don’t stop there. Set it out with pretzels or apple slices for dipping, pair with fresh goat cheese, whirl into yogurt, put a dollop over ice cream or spoon it up right out of the jar in a dark closet. 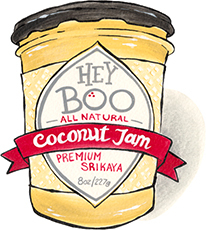 "I don't know if this is a good or a very very very very bad thing, but you have officially gotten me addicted to the Hey Boo Coconut Jam. Is it wrong to want to eat the whole jar in one sitting? Oops. Perhaps I should have only asked that question in my head." "This is killer! We've just used it on toast and just love it!"